Once again Bleary YFC have started back with lots of new and familiar faces attending their club’s first night back in September. 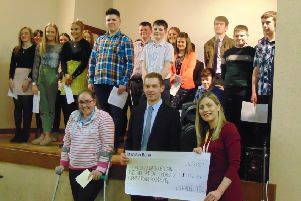 This followed a summer full of events such as the annual treasure hunt and barbecue, annual tractor run and barbecue and also supporting other clubs events. Bleary YFC will continue to meet every other Friday night, the club’s next meeting ‘Spook-tacular’ is Friday 20th October, 8pm at the hall. Its not too late to join so if you are aged between 11-30 and are interested contact the club phone on 07751789901 or contact the club on Facebook. The club’s next big event is the return of the Christmas dinner which will be held in the hall on Friday 8th December with guest singer James Rogers. Tickets are now available so get in contact as soon as possible. This year the club have upgraded their club shirts and would like to take this opportunity to thank sponsors T H Troughton, Moyallon Farm Shop, ABP, Wendy McRoberts Trailer Training and A J Butchers. The club shirts look great and your continued support is much appreciated.